Malware Defense is actually classified as a rogue antispyware application. This may be due to the factor that Malware Defense makes use of misleading tricks and tactics in order to try and convince you that you have all types of threats on your computer system.Malware Defense is actually a clone of antimalware,Protection System as well as Core Guard Antivirus 2009. Malware Defense will make use of a fake scan report, fake system scan report results as well as fake computer security notifications. These are all one big fake attempt to try and make you buy the full version, which doesn’t actually exist. In order to remove Malware Defense from your computer, it is imperative that you make use of a decent antispyware removal product that is able to both detect and automatically remove Malware Defense for you. You can try the manual removal process, but you need to be warned that if you do something incorrectly, you run the risks of further damaging your computer. It is extremely important to drop everything that you are doing and to concentrate entirely on removing Malware Defense from your machine. 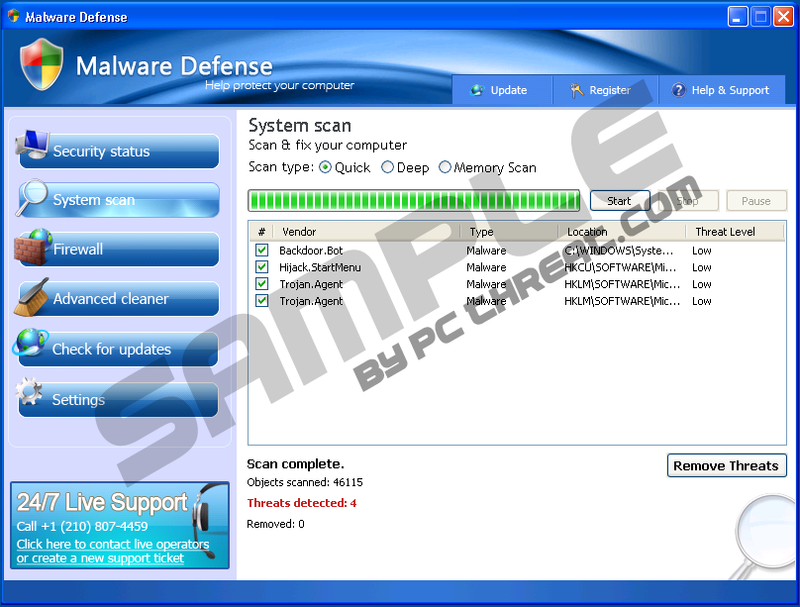 Quick & tested solution for Malware Defense removal.